Krampus is a creature from Germanic folklore. He's often compared to Santa Claus, but is actually much older. 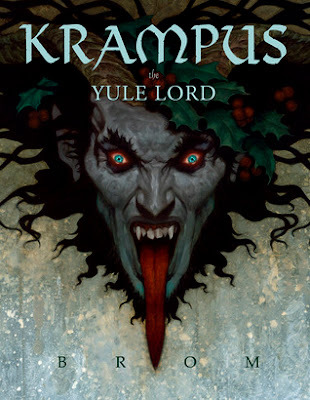 Unlike Santa, who is known more for rewarding good children, Krampus came at Yule to punish bad children. In Krampus: The Yule Lord, the author takes this basis in folklore and builds on it to create a fascinating character and story. Krampus is the Yule Lord, and he visits houses during Yule, leaving gold coins for children who leave him tribute, and beating children who don't. He is adored by all. That is until Santa Claus takes over, imprisoning Krampus in a cave, and perverting the traditions of Yule with his Christian influence. Hundreds of years later, with the help of his Belsnickels, it's time for him to escape and take his revenge. This was a great holiday read. I loved the different take on Santa and Krampus, with Krampus actually being a pretty good guy, and Santa being sort of ambiguous. I also liked Jesse, a guy with problems of his own who gets swept up into the conflict when Santa's sack falls into his trailer. Throughout the story, he's just trying to protect his daughter, but he also comes to care about Krampus (yet also feels weird about setting out to kill Santa Claus). The art is another thing to love about this book. The author, Brom, is also an artist, and there are some amazing illustrations of the characters. I particularly like his depiction of Santa, looking way more badass than any Santa I've ever seen. You can see that image, and some of the other characters, on Brom's website. Check it out! I definitely recommend this to anyone looking for a holiday read that's a bit more on the Pagan side. This book counts for the Christmas Spirit Reading Challenge. Wow! I will have to watch out for this one next year. Sounds like a great read. I checked out his artwork. Amazing! I posted a wrap-up post for the challenge over at The Christmas Spirit. Just wanted to let you know. Hope you enjoyed your Christmas reading!